This game feels like the "true" sequel to Super Mario 64, and that's not a bad thing. For the most part, the game plays nearly identically to Super Mario 64, with a fairly decent automatic camera tracking you as you play. Spin attacks can be performed by gently shaking the Wii remote, which makes them a joy rather than a chore. The Wii Remote is also used to grab star shards and to activate blue stars, which allow Mario to float from point to point in space. The gameplay takes place on land and in outer space. 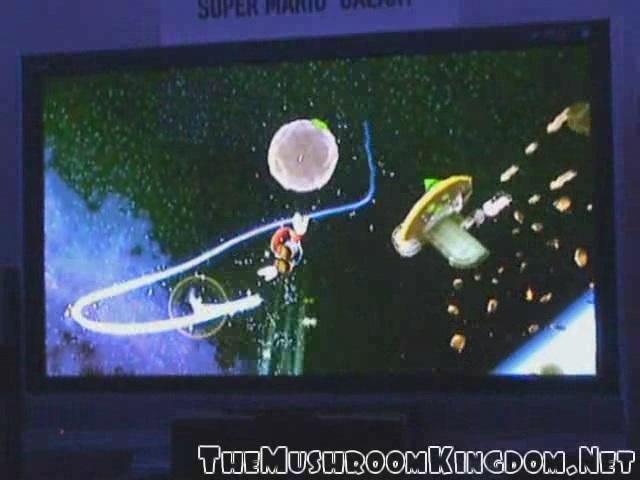 When in space, Mario runs and hops across small planetoids, which looks quite amazing. Classic enemies (BULLET BILLS HAVE ARMS) return, along with several new nasties. The e3 demo was merely a demo, but the game looks rather promising at this point. 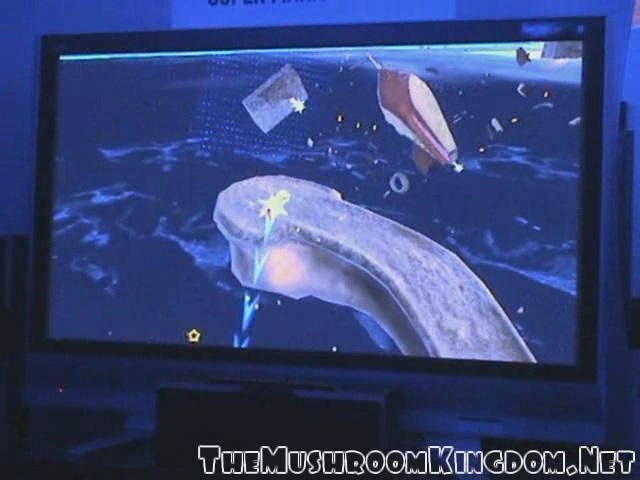 Super Mario Galaxy was clearly the most polished Wii game at E3. The graphics were fairly high poly, particularly given the spherical nature of most of models in the demo, and it included tons of lighting effects. Almost everything appeared very shiny or glowy. 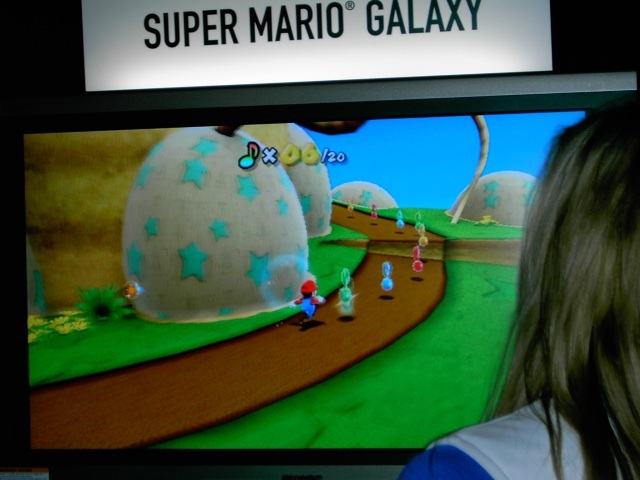 The game begins on Star World and has Mario visiting various small planets, which orbit above a much larger planet, presumably containing the Mushroom Kingdom. As this was a demo created solely for E3, the planets were very small and most were devoid of items or life. 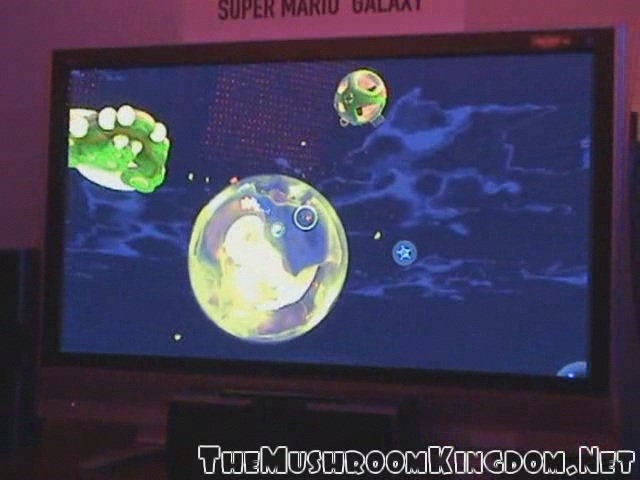 The demo focused mostly on exploring the control of Mario and the gravitational effects of the planetoids. The atmosphere felt somewhere between Mario and Kirby games, as well as including several Zelda elements. 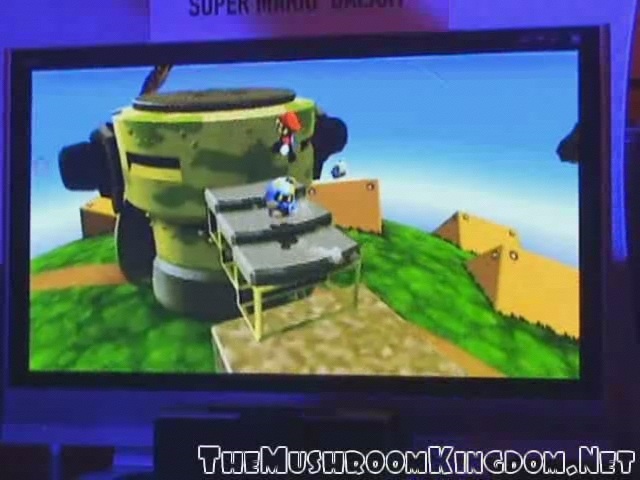 The controls reacted smoothly, with the analog stick moving Mario and the A button being used for jump. 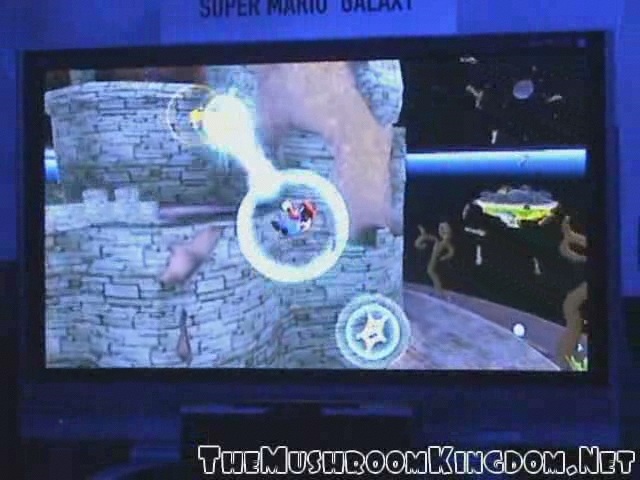 The Wii remote controlled a little "shooting star," which could interact with Mario and the environment. The star acted like a mouse pointer while a long trail (which you may see blurring across the screen in videos). The pointer could be used in conjunction with the B trigger to grab items on screen such as sticky "trees," which appeared similar to ones used in Zelda: Minish Cap, which were used to jump from one area to the next. 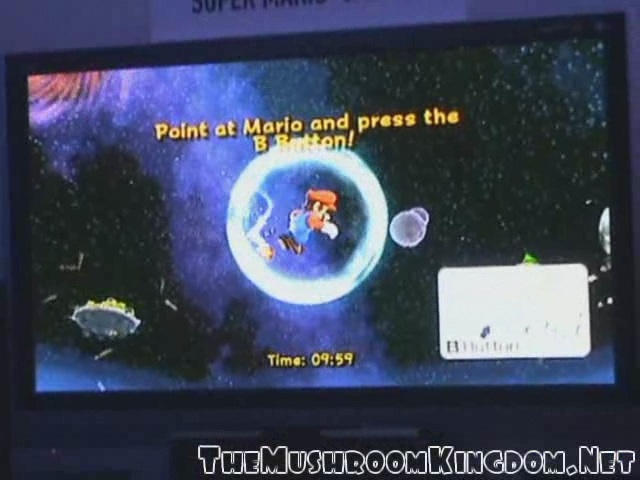 The pointer was also used to spin Mario on star platforms, which launch Mario between planets, and to chain "gravity" stars which guide Mario between planets while he is floating in a bubble. 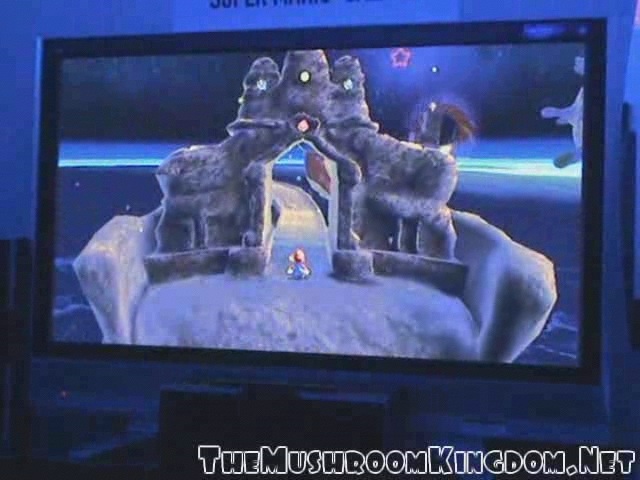 In addition, the pointer could interact with enemy objects, clearing the way for Mario and to collect star shards, which Mario could pick up. Since the entire surface of the planets can be traversed, bottomless pits as a way of dying are nearly absent. However, one planet featured in the demo was filled with holes and had a black hole at its center, which would cost the player a life if fallen into. Other blackholes and enemies provided other means of destruction. Several classic Mario enemies such as Goombas, Bullet Bills and Pokeys appeared. The Bullet Bills homed in on Mario and this fact could be used to guide them into obstacles in order to gain access to certain locations. Several alien-like enemies were also present, some of which were reminiscent of the Deku Scrubs from the Zelda series. These enemies shot balls that had to be deflected and returned by spinning Mario. Various star-hatted Toads were also present along the way and gave advice on how to use the controls. There were plenty of coins and other collectables as well as space rabbits. Several of the planets had two main sides, each with a different theme. Mario could simply run over the edge of one side and the camera would flip so that Mario would appear right-side-up on the other side. 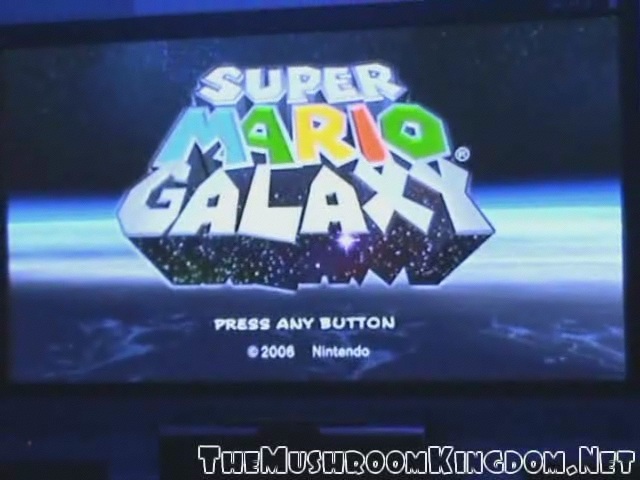 Not only planets filled the Mario galaxy. Doom ships, rocket ships, and asteroids of various shapes also filled the space. A Starman pattern could be seen on the large planet below. While each planetoid had a different theme, some were more interesting than others. One even appeared to be encased in a snow globe. There were three main paths in the E3 demo, each leading to a different boss. One boss was a giant octopus that lived in a pool of lava. This boss shot multiple rocks at Mario, which had to be deflected several times in a manner similar to Shadow Ganon from the Zelda series. The second boss was a three-legged mechanical monster with an insect-like head. Mario had to climb up one of the legs to the head where Bullets Bills are fired. A Bill must be guided into a light at the top of the head in order to kill the boss. After defeating each boss, a Star appeared and upon collection the classic Mario castle completion music played with the text "You Got a Star" (no "Star Get" this time). The camera, while not perfect, was much better than the previous 3D Mario games. Camera control was automatic, as there is no C-stick available to change the view. In the rare cases where Mario was obscured, his outline appeared on the other side of the solid object, so that he would not get lost. 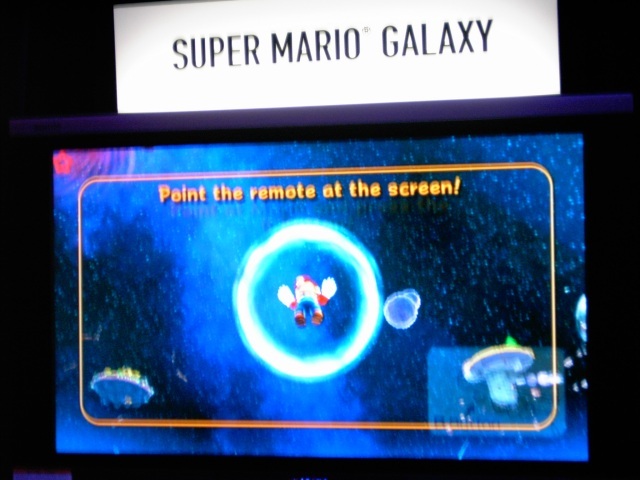 Super Mario Galaxy played well, though as of right now there is a question of how useful the star pointer is, and whether that just makes the game more confusing. That said, the game was one of the more enjoyable Wii games at E3, and being a flagship Mario title, should be excellent when it's finally released. 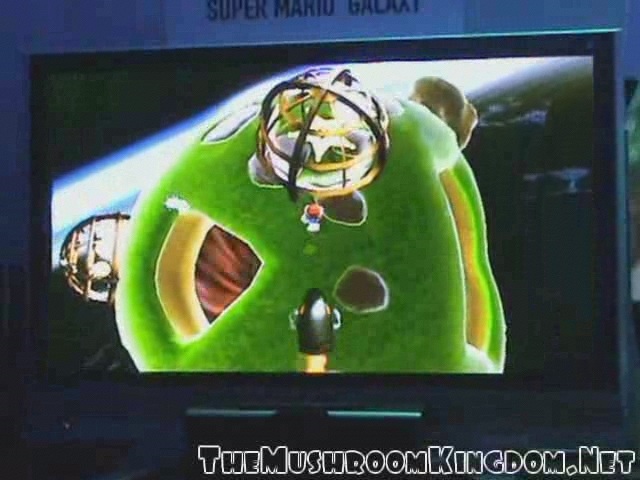 The following videos show all three bosses in the Super Mario Galaxy demo. Update: The videos have been re-encoded and the audio should now work on more media players. Play-through #1: David fights the lava octopus boss. Filmed by Luigison. Play-through #2: David fights the robot boss. Filmed by Luigison. Play-through #3: Luigison fights the spider boss. Filmed by Chupperson. Play-through #4: Chupperson experiments with moves and does some exploring before defeating the robot boss. Filmed by Luigison. Video provided by Luigison and encoded by Chupperson.